Onlay repair (cohort OR) operation using 30 × 30-cm piece of polypropylene mesh (Prolene; Ethicon Inc, Summerville, New Jersey, or Bard Marlex; Davol Inc, Cranston, Rhode Island) incorporated in the midline closure (A) and attached with laxity to the external oblique fascia laterally (B) using longitudinal suture fixation. Retrorectus repair (cohort RR) operation using 30 × 30-cm piece of polypropylene mesh (Prolene; Ethicon Inc, Summerville, New Jersey or Bard Marlex; Davol Inc, Cranston, Rhode Island). A-D, Mesh was attached with laxity and longitudinally to the right posterior rectus fascia (B) (mesh edge folded over the suture), to the midline fascia closure (A), and through the left rectus muscle and anterior fascia (D) (with interrupted suture). The next step would be midline closure of the anterior rectus sheaths (C) over the mesh. Hypothesis Long-term (5-year) recurrence rates are comparable between onlay vs retrorectus mesh-reinforced ventral hernia repairs. Design Retrospective study of prospective data collection. Setting University and Veterans Affairs hospitals. Patients One hundred twenty-five patients treated between February 1988 and September 2001. Ninety-four patients were male. The mean patient age was 56 years (age range, 29-80 years). Fifty percent of patients were smokers, and 32.0% were obese; comorbidities were similar in the 2 cohorts studied. Interventions Open surgical extraperitoneal prosthetic mesh reinforcement of the incisional closure among 75 patients (onlay repair [cohort OR]) or in the retrorectus position among 50 patients (retrorectus repair [cohort RR]). Main Outcome Measures Recurrent hernia, wound infection, and intestinal fistulas. Results Nine patients in cohort OR and 2 patients in cohort RR (8.8%) had wound infections; no fistulas occurred. Complications were similar in the 2 cohorts. One mortality occurred. All hernias recurred at the cranial or caudal edge of the mesh. The median recurrence rates were 20.0% at 15 months in the OR cohort and 4.0% at 9 months in cohort RR (P < .02). Follow-up periods averaged 64 months. Three other patients in cohort OR developed subsequent hernia adjacent to their mesh reinforcement at 72, 73, and 86 months. Conclusions Extraperitoneal mesh reinforcement avoids intestinal complications and subsequent operations to remove mesh. Recurrence is more frequent after onlay mesh reinforcement and usually occurs at the cranial or caudal edge of the mesh within the first 2 years after hernia repair. Retrorectus repair is the preferred open surgical treatment of incisional hernia, but it has not been universally applicable. Hernias developing 6 to 7 years after surgery are not the result of failed earlier repairs. The medical records were reviewed of 125 adult patients with ventral incisional hernias who were treated surgically between February 1988 and September 2001, at 2 affiliated medical centers, the University of Alabama at Birmingham Hospital and the Birmingham Veterans Affairs Medical Center. The research protocol was approved by the institutional review boards of each institution. The patients were culled by searching the operation codes (Current Procedural Terminology codes 49560-49568) at both hospitals during those years for patients undergoing ventral hernia repair, matching them to the surgeon (J.J.G. ), and extracting those with use of prosthetic mesh reinforcement. Although patients treated after 1995 were logged using data forms at the time of treatment, complete data on those treated earlier were retrieved from hospital records. The operative technique used for the onlay mesh reinforcement began with an overlying incision through the fascia and hernia sac. The entirety of the hernia defect was opened and extended cranially and caudally along the full length of the original incision. Following adhesiolysis, the hernia sac, fascial scar, and subcutaneous fat were dissected away from the anterior rectus sheath (on both sides) for a lateral distance of 7 to 10 cm. The peritoneal hernia sac and associated scar tissue were resected. In 2 exceptions, the peritoneal sac was preserved to close a fascial defect and to lie underneath polypropylene mesh (Prolene; Ethicon Inc, Summerville, New Jersey or Bard Marlex; Davol Inc, Cranston, Rhode Island). A 30 × 30-cm (900-cm2) piece of mesh (Prolene) (a similar-sized mesh [Bard Marlex] was used in earlier patients) was sewn longitudinally using continuous 0 polypropylene suture to the exposed anterior sheath or external oblique fascia on a lateral side. The midline fascia was then closed (even under tension) using continuous 0 looped nylon suture that incorporated the mesh in each bite. Care was taken to avoid pulling the mesh under tension and to leave it relaxed over the fascia. Next, the mesh was fixed to the opposite anterior sheath or external oblique longitudinally using polypropylene suture in the same manner (Figure 1). The attached mesh was cut to fit the area, and additional fixation sutures were used at the cranial or caudal edge of the mesh to attach the free edges. A sump drain was laid on the mesh. Prophylactic antibiotic therapy was continued until the drain was removed at 4 days. The retrorectus mesh reinforcement procedure was performed in the same manner, with dissection of the sac and subcutaneous fat from the anterior sheath. On each side, the fascial scar at the inner edge was then excised to uncover rectus muscle, where an open space could be created bluntly along the length of the posterior rectus fascia. The same polypropylene mesh was laid along the lateral edge of a posterior sheath and was fixed to it longitudinally using continuous polypropylene suture. The posterior sheaths were then closed using nylon in the midline, simultaneously incorporating the mesh loosely conveyed from its lateral attachment. Then, single 1 absorbable sutures were placed in a horizontal mattress fashion through the opposite lateroanterior rectus sheath, muscle, and mesh to be tied (Figure 2). These were used to avoid potential needle injury to viscera underneath the fascia. A drain was again conveyed through the abdominal wall to lie on the mesh, and the anterior rectus sheath was closed. Prophylactic antibiotic therapy was used until the retrorectus drain was removed at 4 to 6 days. The initial operation of choice in 1988 was the onlay technique. After 1995, the technique was selected based on the clinical presentation of the patient (ie, history of abdominal operations) and the physical characteristics of the hernia (scar tissue and feasibility of defining the retrorectus layer). Patient and hernia characteristics were compared using univariate statistics, including tests for normality of distribution. Normally distributed continuous variables were compared using t tests, and continuous variables that were not normally distributed were compared between cohorts using Wilcoxon rank sum tests. Categorical variables of interest were compared using the χ2 or Fisher exact test when expected values were low. All analyses were performed using commercially available software (SAS version 9.1.3; SAS Institute, Cary, North Carolina). Seventy-four patients (59.2%) were treated at the Birmingham Veterans Affairs Medical Center and 51 patients (40.8%) at the University of Alabama at Birmingham Hospital (Table). Ninety-four patients (75.2%) were male. The mean patient age was 56 years (age range, 29-80 years). All women were treated at the University of Alabama at Birmingham Hospital. Fifty percent of patients were regular smokers at the time of the initial hernia operation, and 29.6% of patients had chronic obstructive pulmonary disease. Thirty-two percent of patients were obese (body mass index [calculated as weight in kilograms divided by height in meters squared] >35). Thirty-five percent of hernias were recurrent after an earlier repair; 12 of them had previously been repaired using a mesh product. The ventral hernia involved a single fascial defect in 55.2% of patients and comprised multiple defects in 44.0% (Table). The mean approximate diameter of the fascial defect was 10 cm (range, 3-30 cm). In most patients, the adjacent midline fascia was scarred and diastatic, which made repairing the hernia more complex. The fascial defects were closed in all but 2 patients. Seventy-five hernia repairs incorporated polypropylene mesh as an onlay reinforcement over the closure (cohort OR), while 50 hernia repairs incorporated the same mesh placed in a retrorectus position for reinforcement (cohort RR). None of the repairs involved intraperitoneal mesh placement. Patient and hernia characteristics were the same as those already described for both types of hernia repair reinforcement. Drains were placed over the mesh in 97.6% of patients (Table). They remained for 4 days after the onlay procedure and for 6 days after the retrorectus reinforcement (P < .004). One operative mortality (1.3%) occurred, which was in cohort OR (Table). A 74-year-old man with hypertensive arteriosclerotic disease underwent repair of a large long-standing midline hernia, which required a return to the operating room 1 day later because of a wound hematoma. He subsequently developed an acute abdomen and hypotension 7 days later. This operation revealed satisfactory hernia repair but extensive bowel ischemia and necrosis, which was not removed, and the patient died. Wound complications occurred in 28 patients (22.4%), 16 of whom were in cohort OR (Table). The complications included seroma formation after drain removal (8 in each cohort) and hematoma formation (in 12 patients). Among those with hematoma formation, 1 patient in each cohort developed an infection but no subsequent recurrence. Nine patients in cohort OR had wound infection; hernia redeveloped in 2 of them by 1 year. Two patients in cohort RR had wound infection, one of whom underwent further hernia repair near the edge of the mesh 1 year later. Complications were similar in the cohorts. Recurrent hernia developed in 15 patients in cohort OR and in 2 patients in cohort RR (P < .02) (Table). Recurrences developed a median of 15 months after surgery in cohort OR and 9 months after surgery in cohort RR. All but 2 recurrences were repaired again, and each involved application of an additional small piece of polypropylene mesh over the closed recurrence secured at the edge to the mesh placed earlier. One recurrence that was not repaired represented a dubious diagnosis at 5 years, and the other involved 3 hernias surrounding a large piece of mesh placed almost 5 years earlier over and beyond a large peritoneal sac surface. The mean time to recurrence after surgery was 18 months; the mean overall follow-up periods were 66 months in cohort OR and 62 months in cohort RR. Three additional patients in cohort OR developed incisional herniation at the periphery of the mesh 72, 73, and 86 months after the initial repair. These outlier events were considered new rather than recurrent herniations. Nonabsorbable polypropylene mesh was used in this series for ventral hernia repair. The objective was to avoid direct visceral contact with the polypropylene; the fascia (or peritoneal sac) in all patients was closed in the midline, even if under tension. The mesh was incorporated by sutures on the outer surface to that midline closure (or at the circumference of the peritoneal sac). This was done to prevent subsequent midline fascial breakdown and protrusion of another hernia up and under the mesh graft.7 The mesh was not placed under tension but was loosely attached between the midline and the lateral fixation lines (Figures 1 and 2). Wide fixation provides security in the closure to prevent ripping caused by fixation of mesh confined to the fascial midline or defect edges and to reduce midline tension by distributing it laterally across the mesh. This provides patient comfort in Valsalva maneuvers and allows for the shrinking tendencies of mesh.14 Because one can readily use large pieces of mesh (≤30 × 30 cm), the hernia defect and incision were opened along the initial scar line and beyond the edges cranially and caudally to ensure repair of other weakened fascia (diastasis) along that line and to permit more extensive contact with the mesh.3 For this reason, the mesh application to the fascial closure extended to the cranial and caudal extent of the hernia incision. Despite placement of some sutures through mesh into fascia at those edges of the application, the sites admittedly were weak points in the reinforcement technique. Intra-abdominal pressure can cause protrusion more easily at those cranial and caudal edges than anywhere else across the expanse of mesh, including lateral edges, and could produce recurrent hernias.3,5,8,9 Some clinicians have recommended an overlap of 5 to 7 cm at the cranial and caudal edges as necessary,5-7 particularly to allow for mesh shrinkage. The overlap used herein was not that long. The first retrorectus mesh reinforcement at my institutions was undertaken in 1996, whereas the series with onlay mesh reinforcement was initiated in 1988. Fifty-seven of 75 onlay mesh repairs were performed by 1995. When retrorectus repair was initiated using the principles described in 1989 by Stoppa,10 that technique was considered preferable to onlay mesh reinforcement. This was not only because of the preferential placement of mesh underneath the rectus but also because it allowed the anterior rectus sheath to be closed over the mesh at the cranial and caudal edges of the repair, thereby buttressing those recognized weak points.5,9 The retrorectus technique became the preferred technique; 18 onlay repairs compared with 50 retrorectus repairs were performed after 1996. However, retrorectus repair was not universally applicable; it required a definable posterior (fascial) layer separable from rectus muscle, which was sometimes not technically possible with recurrent or long-standing incisional hernias. Seldom did the peritoneum appear separable from muscle if the posterior sheath had been destroyed. Coupled with this problem were occasions when residuals of chronic infection had been present at reoperation; the onlay technique seemed more prudent to avoid subsequent compartment infection.3 I have not tried the operative procedure favorably reported by Novitsky et al.15 They describe a technique for separating parietal peritoneum from rectus fascia and scar, with considerable cranial or caudal extension for preperitoneal placement of mesh. This would simulate the retrorectus repair described herein. In the series by Novitsky et al, the wound infection rate was 12.5%, and recurrence at 28 months was 3%. The recurrence rate of 20.0% (15 patients) in cohort OR is consistent with other studies10,16,17 and is clearly higher than the recurrence rate of 4.0% (2 patients) in cohort RR and rates described elsewhere.3,6,7,18 Each recurrence was at the cranial or caudal edge of the mesh, and this would support the contention that the retrorectus technique is preferable because of the anterior sheath buttress over those edges of the reinforcement.5 Awad et al8 describe the operative forces within these repairs that produce recurrences and emphasize the predominant technical risk of inadequate overlap. Thirteen of 15 patients in the present series underwent reoperation, each with defect closure and onlay mesh extension to about 5 cm beyond the closure. Three second recurrences among these 15 patients were also at the ends (opposite) of the initial mesh reinforcement. 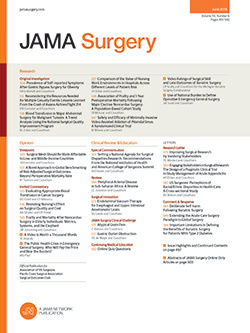 Incisional hernias associated with mesh reinforcement tend to recur within 2 years after repair.1,2,5,10,16 Recurrences are associated with the same major comorbidities as those of the original hernias, particularly obesity (with increased intra-abdominal pressure) and smoking (with consequent chronic obstructive pulmonary disease and chronic episodic increased abdominal pressure associated with coughing).6,10,17,18 The frequency of each of these was at least 1 in 3 among patients in the present study (Table). The additional comorbidity regularly associated with recurrence is wound infection,10,15,17,18 which occurred in 8.8% (11 patients) in the present series (Table). Recurrent hernia eventually developed in 3 of them. The median time to recurrence was 13 months (mean [SD], 18  months) and was similar in the cohorts. The patients herein were followed up, on average, beyond 5 years; many follow-up intervals that were shorter than 5 years involved patients who died earlier (16 patients at 2-53 months [median, 34 months]). The procedure of transfixing the mesh when placed retrorectus was performed in a manner analogous to the onlay mesh technique and did not involve subcutaneous or cutaneous sutures that others have used.3,4,7 For both techniques, the subcutaneous fat was dissected off the surface of the anterior fascia laterally as far as the external oblique fascia. At this lateral extent, the onlay mesh was attached by sutures to the fascia (Figure 1). When the retrorectus repair was done, initial lateral attachment of mesh to fascia was performed using continuous suture sewn to the posterior fascia, while the viscera underneath that layer was protected. When the opposite lateral side of mesh was fixed after the midline closure, the sutures were instead brought up through the anterior fascia and rectus muscle at its lateral extent (Figure 2) because underlying viscera could no longer be protected. An absorbable heavy suture with delayed resorption was used to avoid long-term constriction of musculoaponeurosis7 and to provide sufficient time for mesh cross-linking with the overlying muscle. An additional temporary drain was often placed at this level to accommodate the subcutaneous dissection that had been necessary. In summary, recurrent hernia is more frequent when primary hernia repair is performed without mesh reinforcement. Use of mesh with extraperitoneal placement minimized the long-term (5-year) recurrence rate to less than 15% among the patients in this study, but the recurrence rate was much lower (P < .02) if mesh was placed behind the rectus musculature rather than on top of the anterior rectus sheath. In both cases, adequate mesh overlap in all directions is paramount. The retrorectus technique is preferred when it is technically feasible; residual infection and multiple prior repairs may preclude this option. Correspondence: John J. Gleysteen, MD, Surgical Service, Birmingham Veterans Affairs Medical Center, Room 4343, 700 S 19th St, Birmingham, AL 35233 (jgleyst@bellsouth.net). Accepted for Publication: June 17, 2008. Additional Contributions: Catherine C. Vick, MS, and Mary M. Wesley, MPH, provided statistical analyses.